Small and canine in appearance, these Heartless wander aimlessly until a target draws near. Their bark is bad, but not worse than their bite; they'll snap at you if you hit them. Deflect this with a block to stagger them. 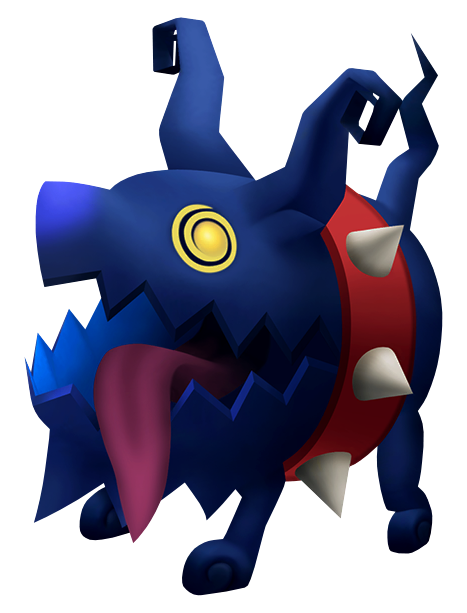 The Rabid Dog, also translated as "Bad Dog" in Kingdom Hearts 358/2 Days and Kingdom Hearts χ, is an Emblem Heartless that is introduced in Kingdom Hearts II. A pack of Rabid Dogs are seen attacking Meg in the Underworld before getting scared off by Sora. Rabid Dogs appear often to fight Sora, but oddly, a pack of three attacked a group of Dusks to help Sora escape with Auron's free will for unknown reasons. A Rabid Dog resembles a small, blue dog with a massive head and an equally massive, toothed maw. Its ears are long, stand on end, and curl at the tips. It has a crooked, blue tail and four short legs with no discernible digits on its paws. Its long, pink tongue is often seen hanging out of its mouth. The Rabid Dog's large, yellow eyes each sport a black spiral pattern. 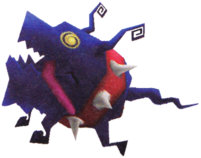 It also wears a large, red collar with several conical, silver spikes on it, though, because of the Heartless's size, it is worn around its waist instead of its neck. Its Heartless emblem is on its rear. 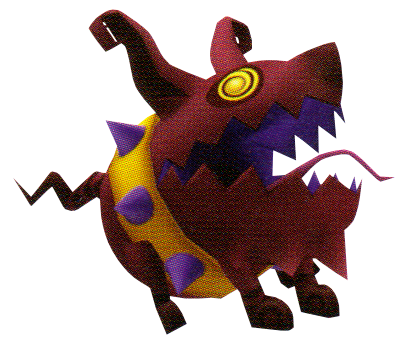 In Kingdom Hearts II Final Mix, the Rabid Dog's body is dark red in color, its mouth is lavender on the inside, and the black spirals in its eyes are red. Its collar is yellow and the spikes on it are lavender. The Rabid Dog's name references the fact that it resembles a real-world dog. It also references rabies, an illness that induces manic behavior, which its Japanese name, "Mad Dog", also references. Dogs are more responsible for transferring the virus to humans than any other animal. In Kingdom Hearts 358/2 Days, it is known as "Bad Dog", which holds a similar meaning. Bark (吠え声, Hoegoe? ): Fires shockwave from mouth. Continuous Barking (連続吠え, Renzoku Hoe? ): Fires four shockwaves. Pounce (飛びかかり, Tobikakari? ): Pounces and bites twice. Rabid Dogs are one of the more harmless enemies, but they tend to appear in packs. Most of the time, they will do nothing. Like most enemies, however, they will retaliate when attacked. They may bark, which causes a sound wave, dealing a large amount of damage, especially at low levels. However, they have low defense, and can be defeated easily. If a Rabid Dog's Pounce attack is blocked, it will be left stunned on the ground, open to attack. They are highly vulnerable to magic.